The experience of shooting a live mountain gorilla film – video in their natural habitat is surely a life changing experience. Gorilla filming is much more than mountain gorilla trekking as it entails the capturing of gorilla videos in their natural habitats as well well as providing travelers with a close face to face encounter with the endangered gentle giants. Just like trekking, mountain gorilla filming can be done in any of the four national parks with the surviving gorillas in the whole world. These national parks are Bwindi impenetrable forest and Mgahinga gorilla national park in southwestern Uganda, volcanoes national park in northwestern Rwanda and Virunga national park in the Democratic Republic of Congo. Mountain gorilla filming was introduced as a strategy to promote gorilla conservation and increase awareness to all people in all parts of the world concerning the endangered species. The cost of a gorilla filming permit varies from country to country but the experience is the same. In uganda a permit for gorilla filming costs approximately 4200usd where as in rwanda it costs roughly 6000usd for an hour bought from responsible government bodies. Secondly you will be required to buy the Gorilla permits for the Entire Gorilla group that your going to visit for Gorilla Filming activity in volcanoes , The maximum number of people / filming crew is 8 Members that will be visiting the gorilla family in order to make sure that the park is gazetted to be visited only by the Filming crew in order to film at maximum (ie The Gorilla Permit costs $1500 Per Person *8 permits is 12,000). Lastly you are also required to deposit USD 2000 with Rwanda Development Broad which will be refunded to you once you have brought back the CD copy to the Development Broad to prove that the filming was for Tourism use and promotion of the Mountain Gorillas in Volcanoes National Park. It should be noted that gorilla Filming for the Price of 19,000 USD is valid for one Day and it can be altered by the Rwanda Development Broad. Government bodies responsible for wildlife conservation and tourism in each of the three countries issue out trekking and filming permits. These bodies include the Uganda wildlife authority (UWA) in Uganda, Rwanda development board in Rwanda and the responsible body in the Democratic Republic of Congo. The permit can be purchased directly from these bodies or else through any trusted tour operator-offering gorilla filming and trekking packages. An earlier discussion with the responsible government bodies is always recommended. This discussion concerns logistics and other activities to easily determine the actual costs. Filmmakers are reminded to send their filming requests as early as three weeks in advance before the actual filming date. Participants are also reminded to fill and submit their application forms to the responsible government bodies as early as possible. Just like in trekking, filming and video shooting involve hiking in the slippery dense tropical forests. The recommended dressing include hiking boots, and gloves, sunglasses, long sleeved shirts and pants, rain gears, hats to protect from direct sun. Additionally, walking sticks and porters are very helpful though not compulsory. Porters carry baggage, which make filming easier and also provide support in case of any sliding and falling. 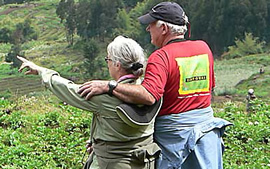 Conclusively therefore, mountain gorilla filming is the best wildlife encounter that all travelers should take part. The venture is very helpful in the promotion of conservation and tourism.